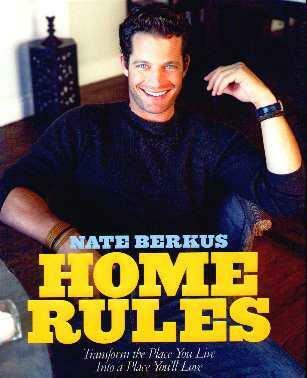 Many of us have come to know and appreciate Nate Berkus on the Oprah Winfrey Show. His subtle yet stylish approach to putting a room (or a home) together is effective and pleasing. Of course his boyish charm goes a long way too. I like Nate's work because he's never over the top or outrageous - he somehow has the natural ability to slop on some paint, plop an ornament in the right place, or add cushions where there weren't any. I mean this in the nicest way - he makes it look so easy. In this, his first book, he covers the whole gamut of one's living space. His quote, "Your home should be a beautiful reflection of who you are and what you love," rings true. If not, why bother, I have to ask. His way of doing things need not break the bank and he suggests you take things slowly to find your style - like painting. It's only paint and can be painted over if you don't get it right the first time. Mixing old and new does work (in fact, you can make anything work in your home, and finding just the spot is sometimes the deal-maker) as does contrasting textures. Palette colors of Nate's on pages 36 and 37 are a great starting point - four colors for a room - one for the sofa, one for the pillows, one for the wall, or one for the trim. Any four items! I like the idea of all rooms having dimmer lights so you can change the lighting (mood) with the turn of a switch. Clever! Sometimes Nate puts too much clutter which for me, makes me crazy, as I prefer starkness (like pages 58 and 81 or "organized chaos" as I like to call it - great bookshelves on page 62) to which you can always add. Nate's kitchen transformations are great, love 'em. My favorite is the restful and peaceful bedroom on page 130 and the bathroom on page 151. I'd like to have had some more "office" ideas for the home as so many of us work from home - maybe another book, Nate? Nate, can I borrow you - I don't have style and I don't even have a home, but when I do? Conclusion - A very helpful book from a very talented man. Prayers for you, Nate - he's with ya.